MAX RPM 5,100. 300MM x 3MM x 20MM. ALL PURPOSE DISC,SUITABLE FOR CUTTING ALL TYPES OF METAL.GOOD SERVICE LIFE. COMPLIANT WITH EN 12413. MAX RPM 13,280. 115MM x 3MM x 22.23MM. 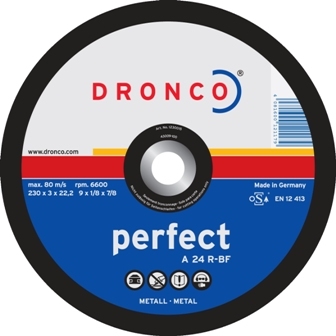 ALL PURPOSE DISC,SUITABLE FOR CUTTING ALL TYPES OF METAL.GOOD SERVICE LIFE. COMPLIANT WITH EN 12413. MAX RPM 15,250. 100MM x 3MM x 16MM. ALL PURPOSE DISC,SUITABLE FOR CUTTING ALL TYPES OF METAL.GOOD SERVICE LIFE. COMPLIANT WITH EN 12413. MAX RPM 12,200. 125MM x 3MM x 22.23MM. ALL PURPOSE DISC,SUITABLE FOR CUTTING ALL TYPES OF METAL.GOOD SERVICE LIFE. COMPLIANT WITH EN 12413. MAX RPM 8,600. 180MM x 3MM x 22.23MM. ALL PURPOSE DISC,SUITABLE FOR CUTTING ALL TYPES OF METAL.GOOD SERVICE LIFE. COMPLIANT WITH EN 12413. MAX RPM 6,600. 230MM x 3MM x 22.23MM. ALL PURPOSE DISC,SUITABLE FOR CUTTING ALL TYPES OF METAL.GOOD SERVICE LIFE. COMPLIANT WITH EN 12413.